South Korean citizens have mourned over the Sewol ferry disaster since April 16. Citizens started holding candlelight vigils to express their condolences and request President Park’s resignation, taking a full responsibility for her administration’s failed initial responses and incompetence that ended up killing more than 300 passengers. Everyday, there are candlelight vigils across the nation. Last Friday, the largest candlelight vigil since the disaster was held at Cheonggye Plaza in Seoul, counting approximately 50,000 protesters. Without fail, hundreds or thousands of policemen blocked streets and barricaded the protesters and, at the end of the candlelight vigil, arrested 115 people. Next day, 95 students were arrested during their quiet and peaceful march, so-called the ‘Stay Put March”. And Monday, another six students were arrested because of protesting and placing placards – requesting President Park Geun-Hye’s stepping down – at the Park Chung Hee Memorial. While none of the candlelight vigils for the Sewol ferry has been reported violent, the police actions have been witnessed unlawful and violent. During the arrests, many candlelight vigil citizens were reported injured, and sexual harassment was witnessed. Even a junior high student was almost taken but rescued by other citizens. Let alone media control and manipulation of public sentiments, the Park Administration certainly showed reign of terror last weekend, which appears to be a warning to whoever attends a candlelight vigil or protest against the government and appears to continue as long as South Koreans gather against the Park Administration. 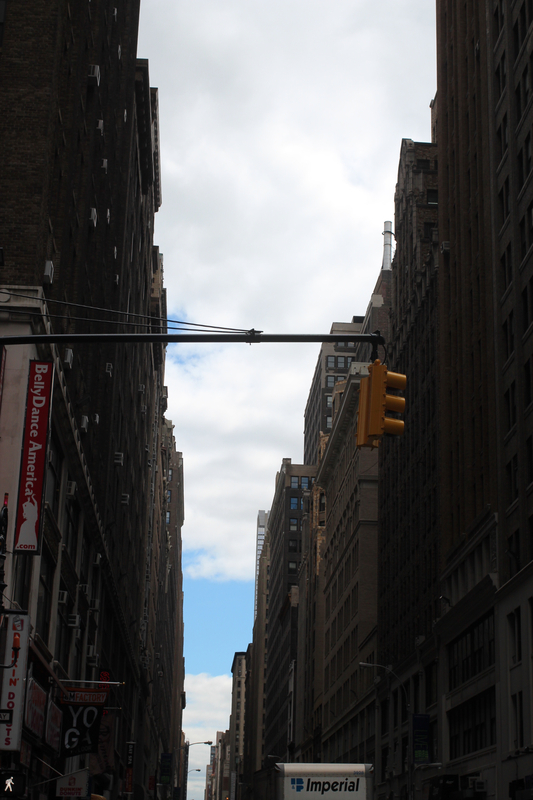 This photo was provided by a Twitterian (@zwarin). Another Twitterian commented on this photo that it looks like a police protest. Now, it is not uncommon that police form human barricades whenever and wherever a candlelight vigil or protest is held, regardless of its size. 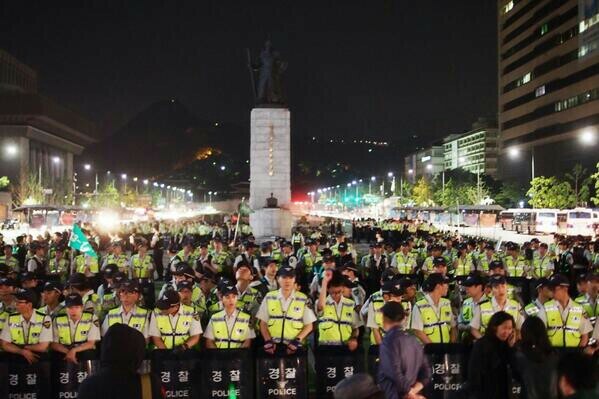 Again, none of the candlelight vigils for the Sewol ferry has been reported violent. Second ad is now placed on the Washington Post. May 16, the second ad is now placed on the Washington Post, following the first one on the New York Times. Since the first ad on the New York Times placed on May 11, main members of the President Park’s party, Saenuri Party, have criticized that placing that ad on the NYT is a pro-North Korean activity against the current government. Today’s ad on the Washington Post is added with Saenuri Party’s false accusation on the ad participants and violations of human rights. 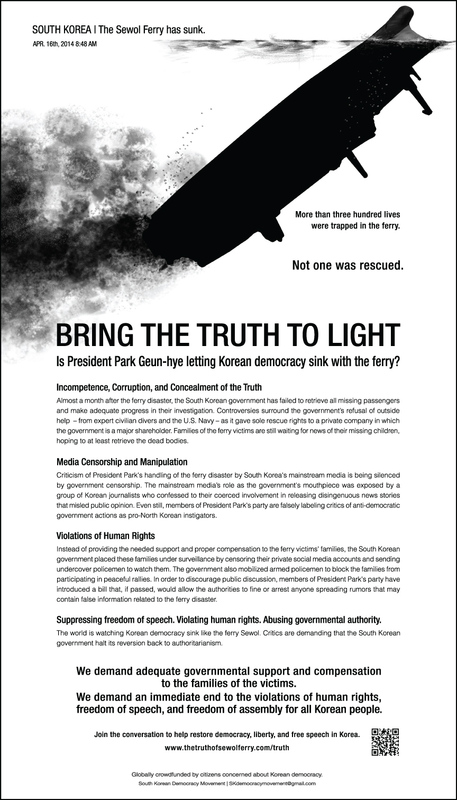 Furious S. Koreans placed a full-page ad in The New York Times last Sunday. 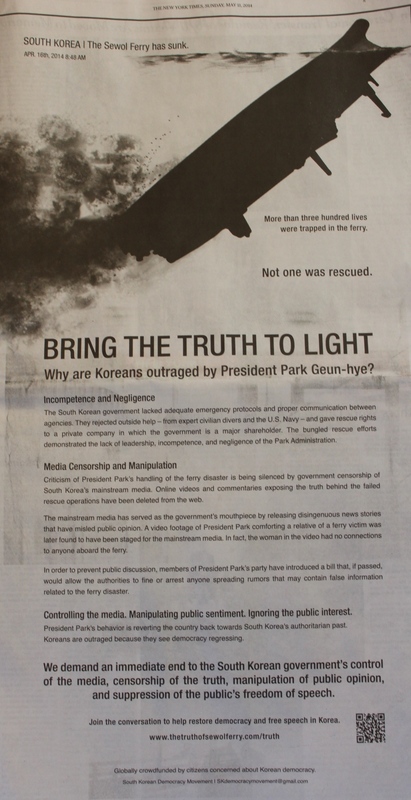 The ad headlines ‘BRING THE TRUTH TO LIGHT’ with a sub-headline “Why are Koreans outraged by President Park Geun-hye?” More than three hundred people were trapped in the South Korea Ferry Sewol on April 16, but no one has been rescued. The Park Administration has been busy hiding the truth and facts utilizing the mainstream media and only blaming the captain , crew, and the cruise company. So, furious South Koreans spontaneously organized this campaign to rebuke Park Administration’s incompetence and negligence and media censorship and manipulation. The ad was funded by 4,129 South Koreans and others who live mainly in the US and the rest of the world and who were concerned about their mother country’s democracy. The fund raising started on April 29 and was open for ten days. The result was a huge success, raising $160,439 of its $58,213 target. It demands the Park Administration to end control of the media, censorship of the truth, manipulation of public opinion, and suppression of the public’s freedom of speech. Most of the reviewers commented Lady M is pricy. So did I. They agreed Lady M is the best. So did I. $8 for a piece of Green tea crepe and $4 for an espresso. The coffee I understand at its location, right across from Central Park, but the crepe was surely expensive for a piece of cake. Many called it a little luxury of their own. I didn’t like the calling it luxury, though, because it felt that I am a pretentious buyer who buys a piece of luxury accessory because of a financial constraint, but who desperately wants an experience of luxury. Anyone who is around should try it. A pretentious luxury or not, it doesn’t matter. Its crepes are so good.